The condotel trend hits the Crystal Coast. Walk through the front door at Palm Suites in Atlantic Beach and you’ll find a pretty typical hotel lobby. There’s a spartan front desk to the right, a bench to the left near a luggage cart and green potted plants all around. Up three blue-carpeted steps sit a few armchairs, and out back is the obligatory swimming pool. But the similarities to a typical hotel end there. This place is different. Palm Suites, which until August 2005 was an unremarkable Days Inn, is now a remarkable hybrid of vacation options. The business is the first of a fledgling influx of condotels (half condo/half hotel) in the area, and it makes for a unique near-hotel experience. Rather than tear down existing hotels, developers are realizing the value of turning them into sets of custom mini-vacation homes. The concept has been successful, most notably, in Florida among other places, and there are four such businesses currently operating or opening soon on the Crystal Coast. “It’s kind of a win-win situation,” says Palm Suites developer Sam Hamad, who was about to put units in a second condotel on the market in Emerald Isle. “By doing the condotels you really don’t lose those hotel units. They are on the market for transient use.” When Hamad purchased the former Days Inn, he took everything out of the rooms and gave them a general upgrade as part of an estimated $2 million renovation. Then Hamad’s Morehead City company, Hamad Realty, accepted bids on each individual room, or unit. Buyers, wanting a place at the beach they wouldn’t have to manage, swept them up. Each unit was decorated according to the owners’ tastes, which gives the 90-room Palm Suites as many personalities as there are units. Walking down the hallways to the rooms has the feel of walking through any random hotel in the country. But open the door to your room and you’re transported to wherever the owner wants to take you. A recent overnight stay in Room 109—with its hardwood flooring, flat-screen TVs, modern wall art and colorful accents—felt more like a sabbatical in a small apartment on New York’s Upper West Side, only without the $3,500 rent. The room’s mini-kitchen includes a refrigerator, a microwave, a high-end coffeemaker, a stylish blender and all the accoutrements necessary for making a quick lunch before heading over to the beach, which is only three blocks away. Track lighting hangs over the banister separating the living area from the down-a-level sleeping area, which has its own TV. Two inviting wicker chairs—one black and one lime green—and a comfy futon surround a black coffee table. The globe-shaped chandelier hanging over the cozy two-person dining nook helps complete the feel that this is definitely not the Holiday Inn. Still, there’s the 24-hour desk available for everything from information to wake-up calls, and the housekeeping staff keeps the beds made and the rooms clean. 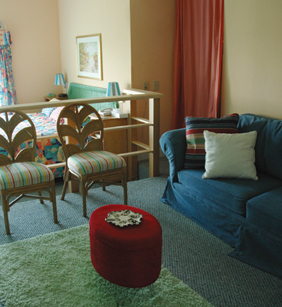 The rooms, which all have their own distinct style, are available on a reasonable, per-night basis. 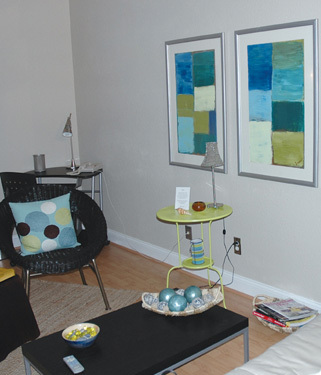 The staff ensures that all the comforts of a chic condo meet the convenience of a hotel. The units have sold for between $109,000 and $225,000, Palm Suites rental manager Ray Tillery said, and the owners come from all over the state. The soundside rooms rent for $135-$145 per night in season and for $65-$75 a night from Oct. 31-March 1. Judy Cowan, a freelance graphic designer from Wilmington, and her husband, Frank, bought Room 109 in April 2006 after selling their place in Morehead City. They spend about a week per month in their unit while Frank, who’s in sales for a cigar distributor, works his territory. As owners the Cowans get 65 percent of the rent customers spend on their room. Palm Suites keeps 35 percent and sends the owners a check every month. Judy Cowan says she’s been surprised at how many people have stayed in their place. “We’ve been pleased with the amount of rent,” she says, relaxing in the lobby. “The first year, we did not anticipate it was going to be rented all the time, and we really don’t want it to be rented all the time. The Cowans bought their unit for $122,000 and put an estimated $5,500 into sprucing it up. The hardwood flooring was the biggest expense, but the overhaul also included painting, furniture and new bathroom fixtures. Other owners have been equally creative. Room 136, which has a small balcony with a breathtaking view of the marsh leading out to Bogue Sound, is distinctive by its warm blue sofa, a green armchair that begs to be used and a door-shaped, bamboo room divider. Room 224 includes a home-like tile floor, a desk dividing the living area from the sleeping area, a blue-striped comforter and an unusual double-crowned headboard. Room 122, with more of a nautical feel, has a bright red sofa, colorful bedding and a matching curtain on the back door. A hula skirt worn by a small, round table gives the unit an extra touch. Three units have hardwood floors, and many have flat-screen TVs. The largest unit was created when the owner bought an adjacent former conference room and doubled the unit’s size. Behind the building, a 110-foot dock winds over the marsh and out into the sound, capped off by a gazebo with an expansive view. It includes electricity, a fish-cleaning station, picnic tables and a nearby accessible boat ramp. Two additional condotels have popped up recently in Atlantic Beach in addition to Hamad’s latest project, the Islander in Emerald Isle. Whether it’s a trend remains to be seen. Tillery, a veteran of the area’s hospitality industry, is an enthusiastic advocate of the concept. On a tour of the building he points out the attention paid to detail by the owners, each of whom puts his or her own signature on the property.